Air borne road dust occurs for a variety of reasons. Overloaded trucks in front of you spilling out dirt and sand, or the wind kicking up sand leftover from winter treated roads are just two of many possible scenarios. The problem isn’t helped by the fact that you could be riding through the dust at 70 mph, which is just 4 mph shy of a category 1 hurricane wind speed. Dust blowing across your eyes or getting trapped under an eyelid can cause a scratch injury called a corneal abrasion. Of course, the eye injury can cause you to get into an accident. Cement is an extremely abrasive powder. In addition to possible eye abrasion injuries, extensive and prolonged contact with the eye can cause chemical burns. You don’t have to work in a cement factory to expose yourself. Injury can happen when using it in projects around the home. Making concrete requires mixing Portland cement with other aggregate material. Pouring cement powder from heavy bags exposes your hands, lungs, and eyes to fine cement dust that floats in the air. When powdered cement gets fluffed up, it behaves like a fluid in that it can easily splash on you if you aren’t careful. For most people, contact with the urushiol oil within the leaves and stems of poison ivy will cause a painful rash. It can spread to other parts of the body by simple contact with the original exposed flesh. Removing poison ivy vines from infested trees requires a great deal of care. Not only must you wear gloves, you should wear long-sleeved shirts and long pants. In addition, you don’t want accidental contact with your eyes. Prescription safety glasses that protect against dust will prevent bits of poison ivy vine, leaves, and grit between the vine and the tree from getting into your eyes. Backyard application involves spraying pesticide onto plants. If the wind shifts direction or you accidentally spray upwind, you will expose yourself, including your eyes, to the chemical. It may also splash back at you when hitting a wall surface. Many pesticides are toxic. If they make contact with your eyes, they may cause irritation, blindness, or do nothing at all except enter your body through the eyes. The effect depends on the pesticide used. Fiberglass is used for home insulation. Handling it and especially trimming or cutting it can produce fiberglass dust, which is floating bits of tiny glass fibers and bits of calcium, aluminum, and other metals. Contact with the eyes causes irritation and inflammation. If you fail to seek medical attention, permanent damage can result. If your yard hasn’t seen rain in a long while, activities such as lawn mowing or leaf blowing can kick up soil particles into the air. This exposes your eyes to grit, fertilizer, and airborne particles of dried animal feces. Contact with your eyes may cause irritation and possibly an infection called conjunctivitis, or “pink eye.” Pink eye is an inflammation of the white part of the eyes and the underside of the eyelids. It is also caused by an allergic reaction to the various constituents of the dust. These are just six of many common situations that expose your eyes to hazardous dust. 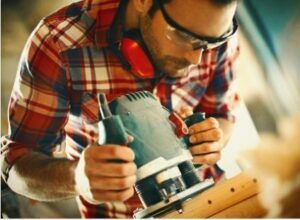 Preserve your vision by using prescription safety glasses when working in environments that can damage your eyes. For help in selecting the right glasses and for answers to your questions, don’t hesitate to contact us.